Social networks are great, but most of what we find on them is irrelevant or not very interesting. Lists are another thing almost everyone loves. You can list movies 5 Websites To Make Your Own Personal Movie Lists 5 Websites To Make Your Own Personal Movie Lists Read More , you can list books 8 Bestseller Lists To Find Books To Read 8 Bestseller Lists To Find Books To Read Read More , and about anything else you can think up. But other than reading them and moving on, there’s nothing much to do with them. First world problem? I think so. Culturalist is a new website that’s going to solve this problem for you. It’s about lists, and it’s also social. Wouldn’t it be great fun to make your own top 10 lists about anything, share them, and explore lists by others to join in on the fun? It would, and it is. 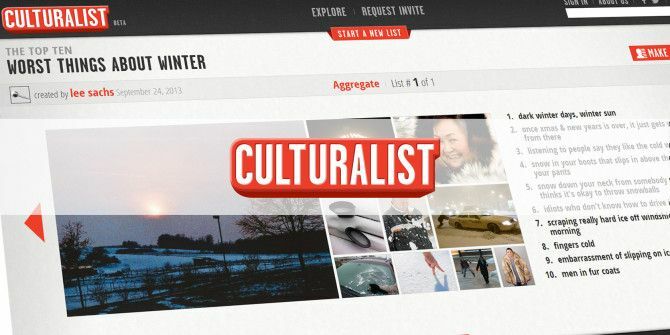 Unfortunately, Culturalist is still in invite-only beta. But don’t let that worry you — we’ve secured some invites for you. Read on to get your hands on them. In its own words, Culturalist is “the social network where the culture conversation is happening“. The site is built around top 10 lists made by its users. You can browse these lists, add your own versions to them if you don’t agree, or create a brand new list from scratch. You can “Like” lists, share lists, follow list authors, and join list conversations. The more lists you author, the more followers you will probably have, which will make the whole thing more interesting. While you wait for your invite to be approved (and it will be very quickly if you use our link), you can start exploring existing lists without ever signing in. Just scroll down through the lists and click on something you’re interested in. The feature is pretty limited at the moment — there’s no way to browse lists by categories or anything like that — but you can use the search box on top to look for specific keywords. For most lists, you’ll immediately notice something interesting: there’s an “Aggregate” version, and then there are actual lists made by actual users. What is this all about? When several users make the same list, Culturalist creates an Aggregate which is a sort of a summation of all the available lists. If you want to view the actual lists, either click the number of lists linked next to the word Aggregate, or scroll through the list using the big red arrows. While viewing a list, all the list’s media will be displayed on the left. These can be images, animated GIFs, or even videos. When you click an item on the list, a lightbox opens with the full version of the media. This also includes a link to the original image source. Once your invite is approved, you can join the fun more actively. What are your options? When you first sign in, you’ll find a list of featured lists for you to explore. You can also find lists using the methods mentioned above. Once you find a list you like, there are several things you can do. If you’re interested in the list’s subject, you can “follow the conversation” to receive notifications when the list is updated. You can also share the list on Twitter or Facebook. If you’re viewing an actual list and not an Aggregate, you can Like it (the author will be notified), and click through to the list’s author to see their other lists and follow them. Last but not least, if you don’t really agree with this list, and want to contribute your own opinions, you can click “Make My List” to add your own version of the list to the Aggregate. There are two ways to create a list: making your own version of an existing list, as mentioned above. or creating a brand new one. When opting for the first, the list’s title will be decided for you, and you’ll find suggested list items on the right which come from the already existing lists. If you choose an existing item, it will even come with existing media for you to choose from. When creating a list from scratch, you’ll need to give it a title. You can choose whether it’s a Best or Worst list, go for the “Best ____ in/of _____” format, or simply fill in the first line only, such as in “Best candy for movies”. This will bring you to the same interface as above, only this time you won’t get any suggestions, but will have to come up with the whole thing from scratch on your own. If, however, a similar item already exists in the database, you’ll get suggestions for it as you type. If you find something that looks right, choosing it will automatically fill in the media as well. You can, of course, switch to different media if you wish. Even if you don’t choose one the of the suggested items, you’ll still get suggested media from previously added items to choose from. As you fill in your items on the right, the media mosaic on the left gets automatically populated. You can drag list items around to change their position in the list, so don’t worry about the order initially. Just make your list. You can work on your lists in several bouts. Simply save them as draft to access them again through your profile and continue editing them. When a list is done, hit publish, and it’s live! You can always go back and edit your list, even after its published, so nothing is final. It’s all in good fun. If you feel like giving Culturalist a spin, you can request an invite and wait a week to be approved, or you can use our special link, and get approved immediately! The link is only good for the first 200 users who use it, so if you don’t want to wait, hurry up. To get a quick invite to Culturalist, click this link [No longer available], and enter your information for an invite. You will be approved within two hours of the request, probably less. Keep in mind that actual people approve you and not an automated process, so you may have to wait a bit longer depending on the time of day, but you will be approved immediately once someone sees your request. Don’t feel like creating you own lists? We have you covered. Our a dosen of different Best Of lists will keep you busy for a while. Do you like the idea behind Culturalist, or do you think we have enough social networks to contend with? Share your Culturalist experiences in the comments after you get in.